Did you know the final season of Game of Thrones is going to air soon? Nope? Well, you must be the only person in the world not dodging potential spoilers at every turn and rapidly re-watching season seven to emotionally prepare for the Great War and the end of it all. Here’s a little tip for not ruining the viewing experience: Stay away from Sophie Turner. As the rumour mill churns and expectations for the finale spread across the Internet like wildfire, all heads are turned to the talented actors and secret-keepers who play those in the running for the Iron Throne. We’ve already heard from Liam Cunningham, who plays the Onion Knight, he suspects everyone will die, in accordance with the show’s most prominent motto: Valar Morghulis. Cunningham has mused ‘all men must die’, seeming to confirm audiences can expect death with a slice of death on the side in the curtain call for Westeros. So far, so far. That doesn’t mean anything. We’re all going to die. Don’t forget ‘Valar Morghulis’, which is one of the phrases on the show which means ‘All men must die’. Elsewhere theorists believe Sansa Stark and Arya will be outlived by their beloved Jon Snow, after seeing the Crypts of Winterfell teaser trailer. 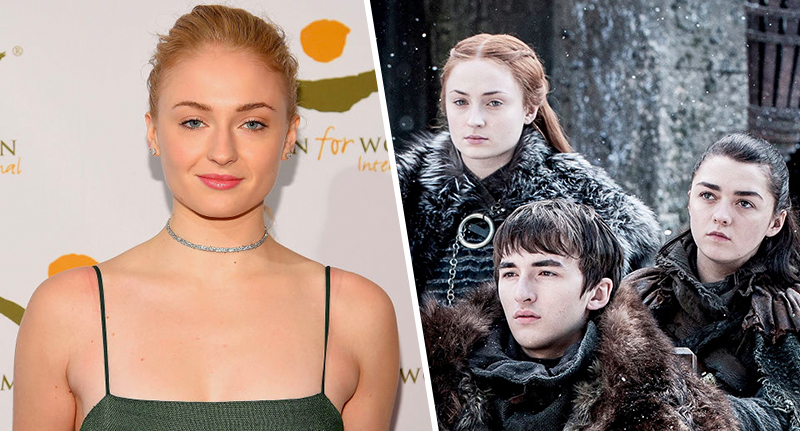 With ears to the ground for any tiny hint of bloody foreshadowing or the smallest slip of the tongue, Sophie Turner has come over all Sansa and says she’s scared she’ll be the one to let the proverbial cat out of the bag. The actor told W magazine she is terrified of revealing all. I’m so bad at keeping secrets. I don’t think people tell me things anymore because they know that I can’t keep them. I’ve already told the ending of Game of Thrones to a few people… sober. I was like, ‘Hey, if you want to know, I’ll tell you.’ But it’s people that I know, not random people. It’s people that I know will keep the secret. Some might assume Turner is really putting herself and Sansa Stark in the firing line – literally and professionally – here, but HBO are already calling curtains on this glorious Game of Thrones anyway. I’m good at keeping secrets, Sophie… What have you got to lose?